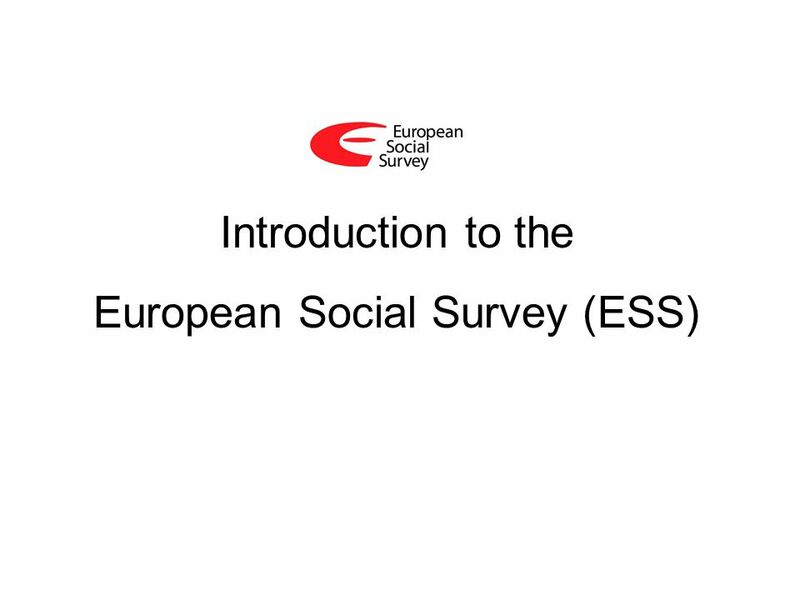 Introduction to the European Social Survey (ESS). 2 What is the ESS? 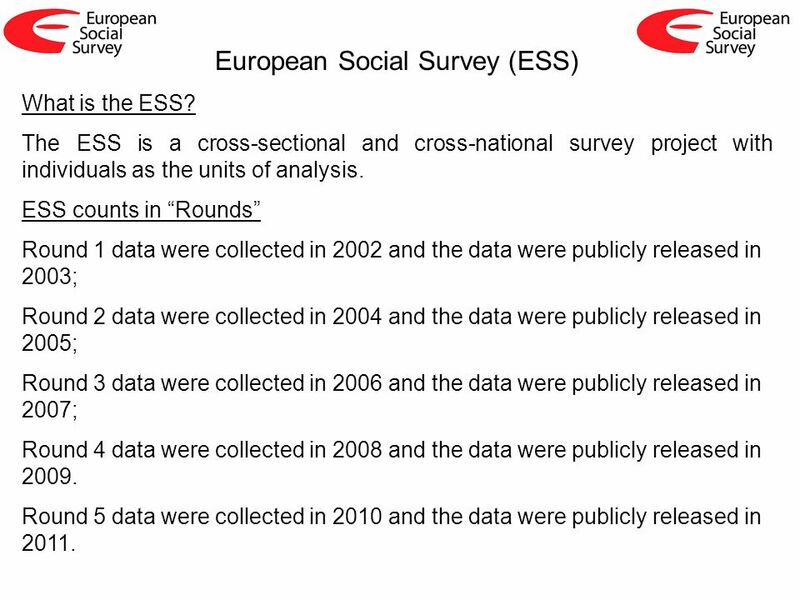 The ESS is a cross-sectional and cross-national survey project with individuals as the units of analysis. 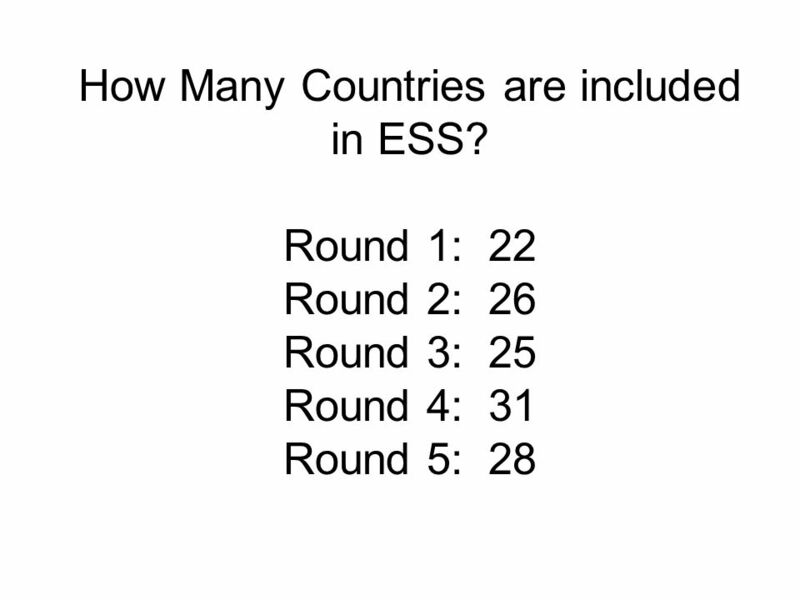 ESS counts in Rounds Round 1 data were collected in 2002 and the data were publicly released in 2003; Round 2 data were collected in 2004 and the data were publicly released in 2005; Round 3 data were collected in 2006 and the data were publicly released in 2007; Round 4 data were collected in 2008 and the data were publicly released in 2009. Round 5 data were collected in 2010 and the data were publicly released in 2011. 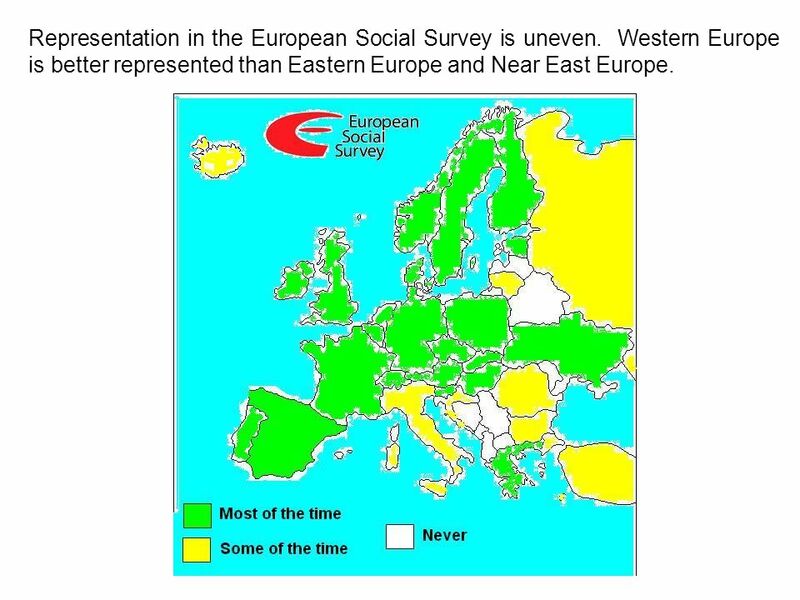 4 Representation in the European Social Survey is uneven. Western Europe is better represented than Eastern Europe and Near East Europe. 7 What explains differences in representation? Research Infrastructure Explanation Research infrastructure refers to the resources and services within a country that creates and executes research projects. Resources and services includes public and private expenditures on research and development, kind and quality of research institutions, and education in conducting research. 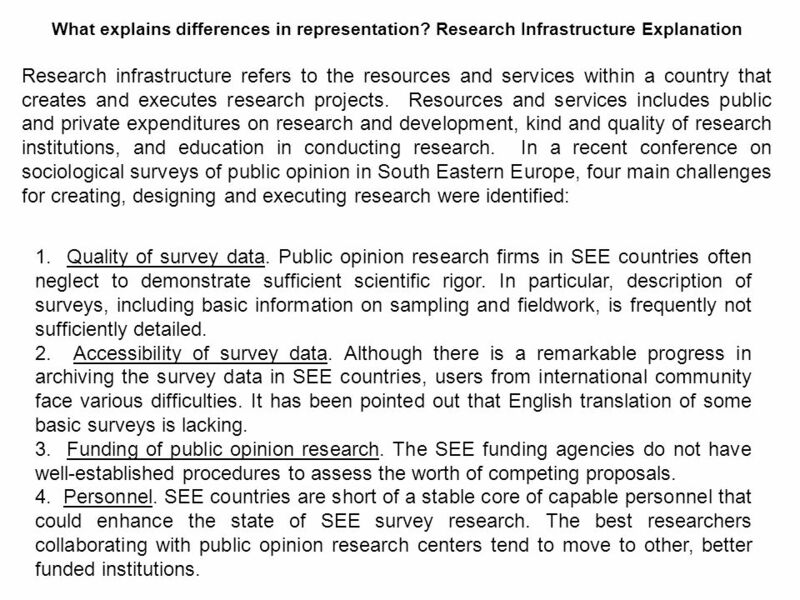 In a recent conference on sociological surveys of public opinion in South Eastern Europe, four main challenges for creating, designing and executing research were identified: 1. Quality of survey data. 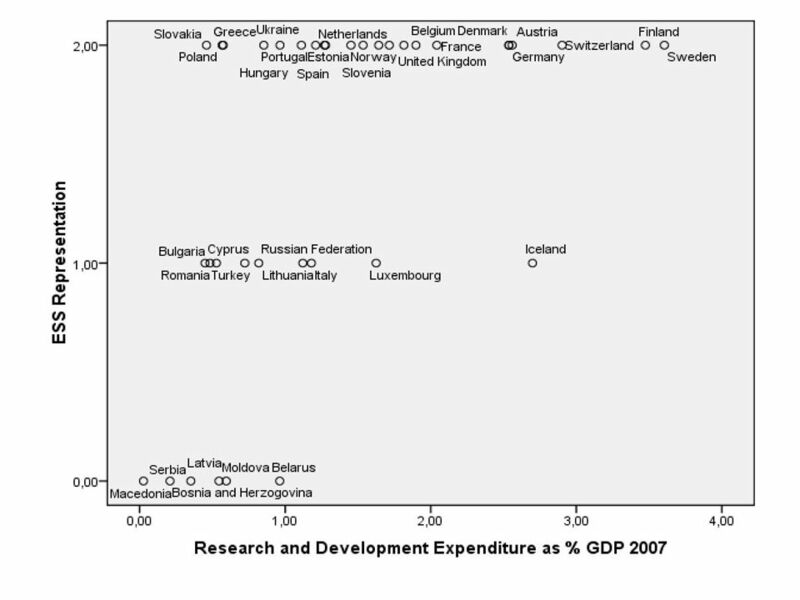 Public opinion research firms in SEE countries often neglect to demonstrate sufficient scientific rigor. In particular, description of surveys, including basic information on sampling and fieldwork, is frequently not sufficiently detailed. 2. Accessibility of survey data. Although there is a remarkable progress in archiving the survey data in SEE countries, users from international community face various difficulties. 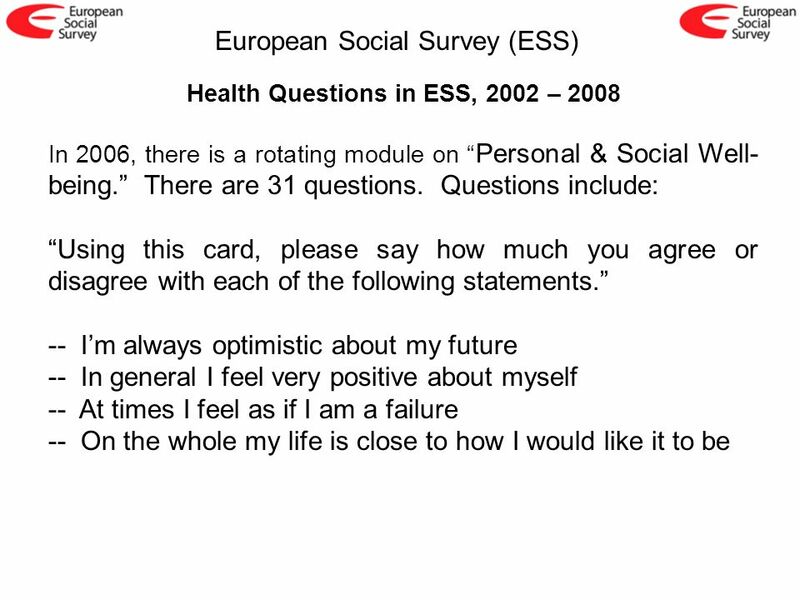 It has been pointed out that English translation of some basic surveys is lacking. 3. 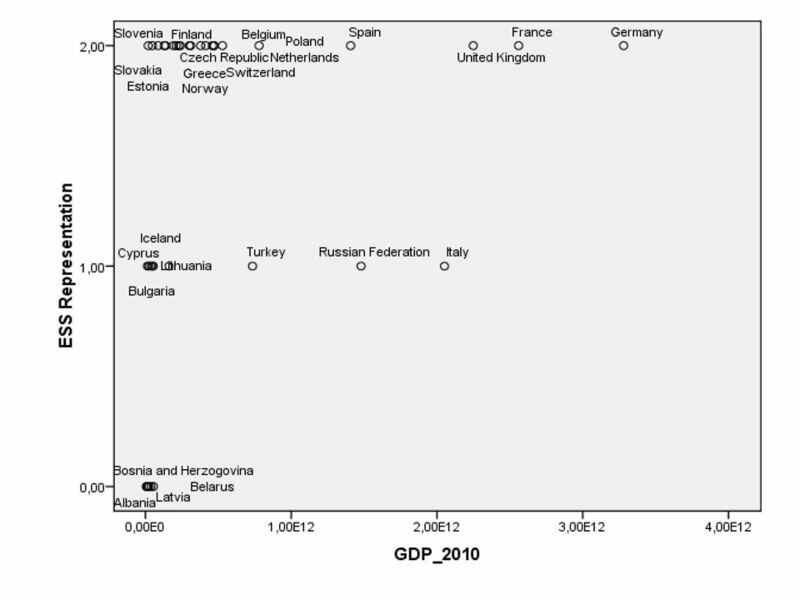 Funding of public opinion research. The SEE funding agencies do not have well-established procedures to assess the worth of competing proposals. 4. Personnel. SEE countries are short of a stable core of capable personnel that could enhance the state of SEE survey research. The best researchers collaborating with public opinion research centers tend to move to other, better funded institutions. 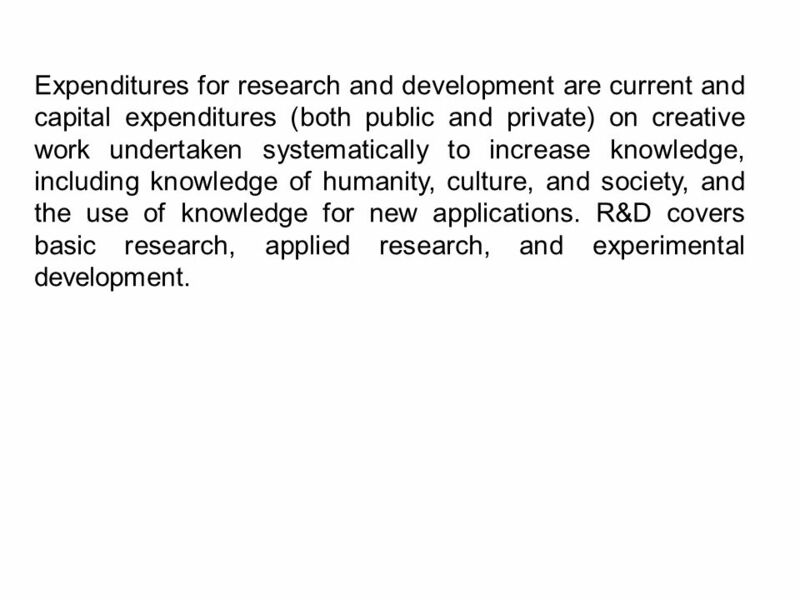 8 Expenditures for research and development are current and capital expenditures (both public and private) on creative work undertaken systematically to increase knowledge, including knowledge of humanity, culture, and society, and the use of knowledge for new applications. R&D covers basic research, applied research, and experimental development. 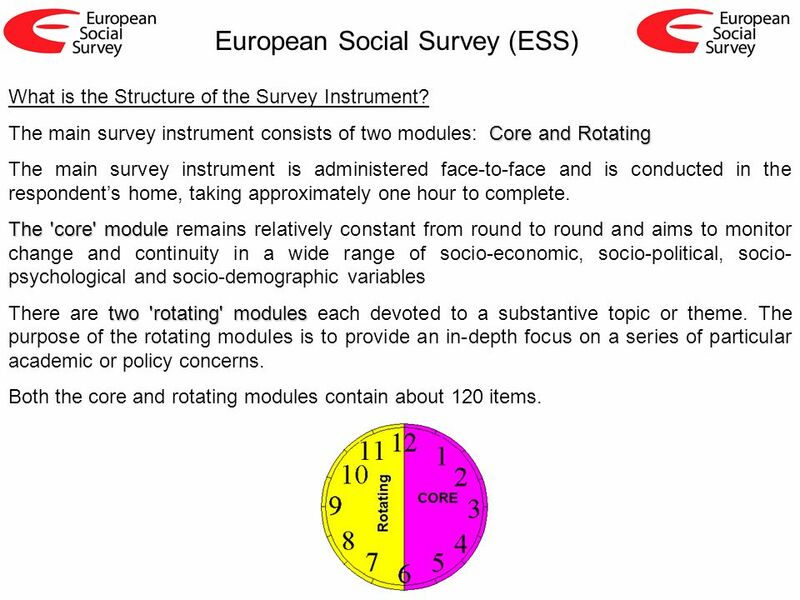 12 European Social Survey (ESS) What is the Structure of the Survey Instrument? Core and Rotating The main survey instrument consists of two modules: Core and Rotating The main survey instrument is administered face-to-face and is conducted in the respondents home, taking approximately one hour to complete. The 'core' module The 'core' module remains relatively constant from round to round and aims to monitor change and continuity in a wide range of socio-economic, socio-political, socio- psychological and socio-demographic variables two 'rotating' modules There are two 'rotating' modules each devoted to a substantive topic or theme. 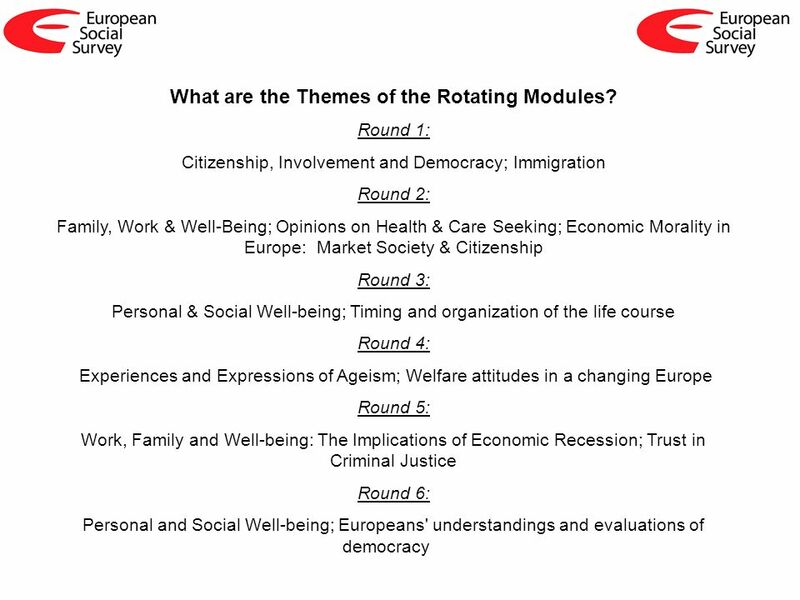 The purpose of the rotating modules is to provide an in-depth focus on a series of particular academic or policy concerns. Both the core and rotating modules contain about 120 items. 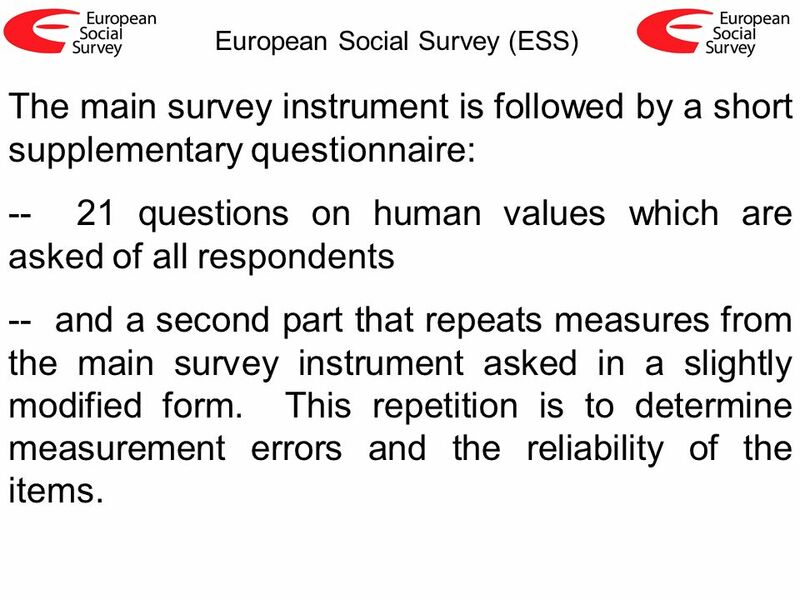 13 European Social Survey (ESS) The main survey instrument is followed by a short supplementary questionnaire: -- 21 questions on human values which are asked of all respondents -- and a second part that repeats measures from the main survey instrument asked in a slightly modified form. This repetition is to determine measurement errors and the reliability of the items. 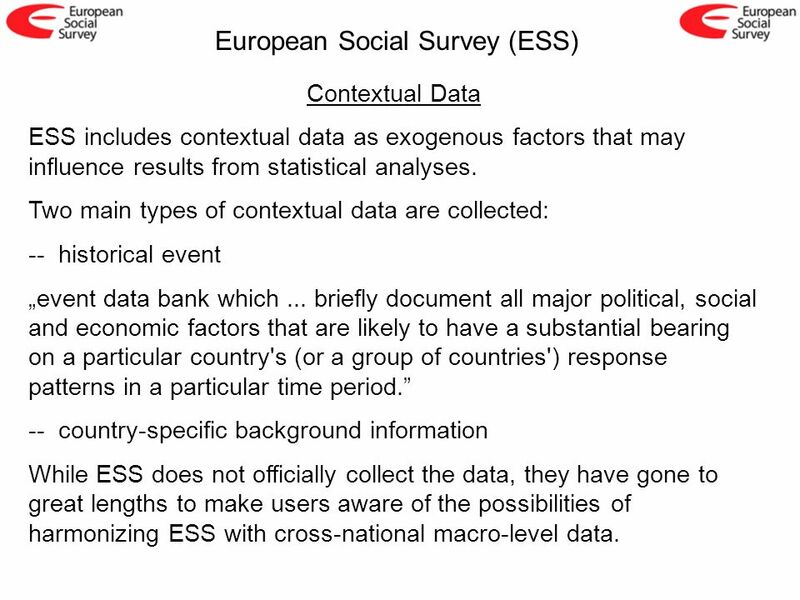 16 European Social Survey (ESS) Contextual Data ESS includes contextual data as exogenous factors that may influence results from statistical analyses. 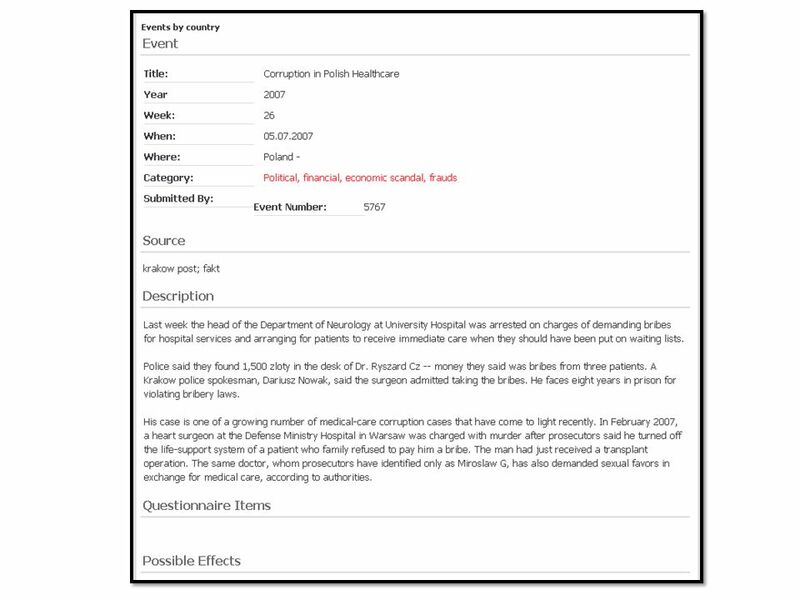 Two main types of contextual data are collected: -- historical event event data bank which... briefly document all major political, social and economic factors that are likely to have a substantial bearing on a particular country's (or a group of countries') response patterns in a particular time period. 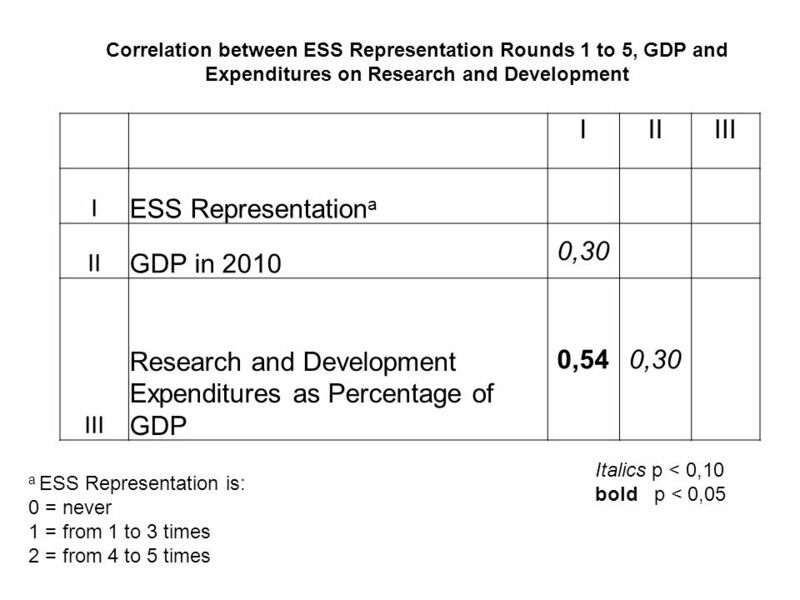 -- country-specific background information While ESS does not officially collect the data, they have gone to great lengths to make users aware of the possibilities of harmonizing ESS with cross-national macro-level data. 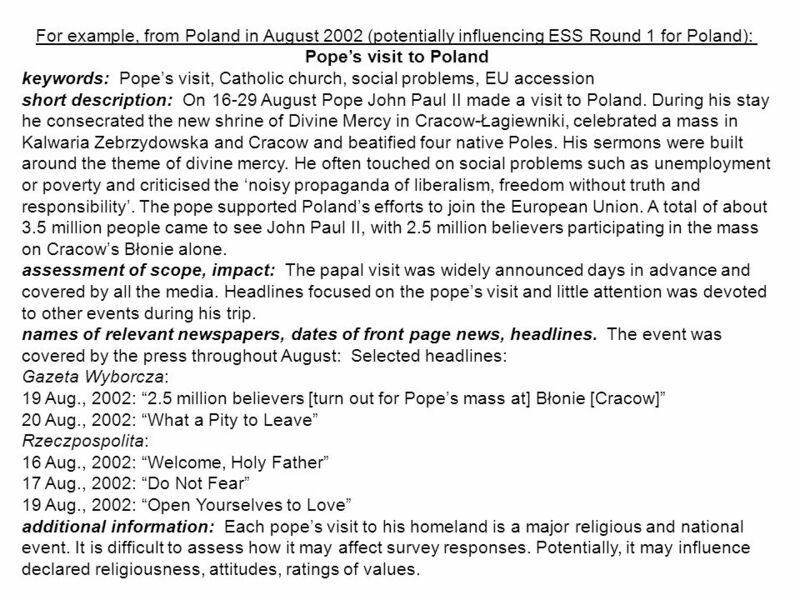 17 For example, from Poland in August 2002 (potentially influencing ESS Round 1 for Poland): Popes visit to Poland keywords: Popes visit, Catholic church, social problems, EU accession short description: On 16-29 August Pope John Paul II made a visit to Poland. During his stay he consecrated the new shrine of Divine Mercy in Cracow-Łagiewniki, celebrated a mass in Kalwaria Zebrzydowska and Cracow and beatified four native Poles. His sermons were built around the theme of divine mercy. He often touched on social problems such as unemployment or poverty and criticised the noisy propaganda of liberalism, freedom without truth and responsibility. The pope supported Polands efforts to join the European Union. A total of about 3.5 million people came to see John Paul II, with 2.5 million believers participating in the mass on Cracows Błonie alone. assessment of scope, impact: The papal visit was widely announced days in advance and covered by all the media. Headlines focused on the popes visit and little attention was devoted to other events during his trip. names of relevant newspapers, dates of front page news, headlines. The event was covered by the press throughout August: Selected headlines: Gazeta Wyborcza: 19 Aug., 2002: 2.5 million believers [turn out for Popes mass at] Błonie [Cracow] 20 Aug., 2002: What a Pity to Leave Rzeczpospolita: 16 Aug., 2002: Welcome, Holy Father 17 Aug., 2002: Do Not Fear 19 Aug., 2002: Open Yourselves to Love additional information: Each popes visit to his homeland is a major religious and national event. It is difficult to assess how it may affect survey responses. Potentially, it may influence declared religiousness, attitudes, ratings of values. 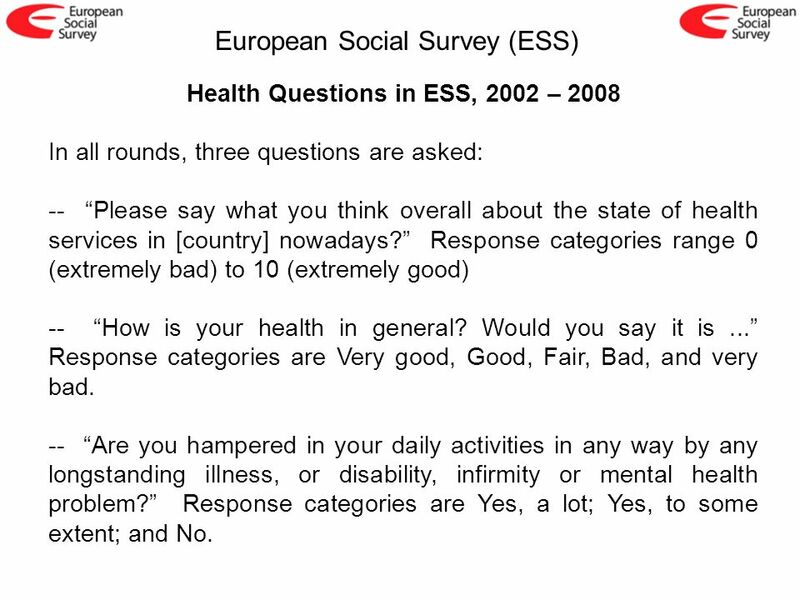 18 European Social Survey (ESS) Health Questions in ESS, 2002 – 2008 In all rounds, three questions are asked: -- Please say what you think overall about the state of health services in [country] nowadays? Response categories range 0 (extremely bad) to 10 (extremely good) -- How is your health in general? Would you say it is... Response categories are Very good, Good, Fair, Bad, and very bad. -- Are you hampered in your daily activities in any way by any longstanding illness, or disability, infirmity or mental health problem? Response categories are Yes, a lot; Yes, to some extent; and No. 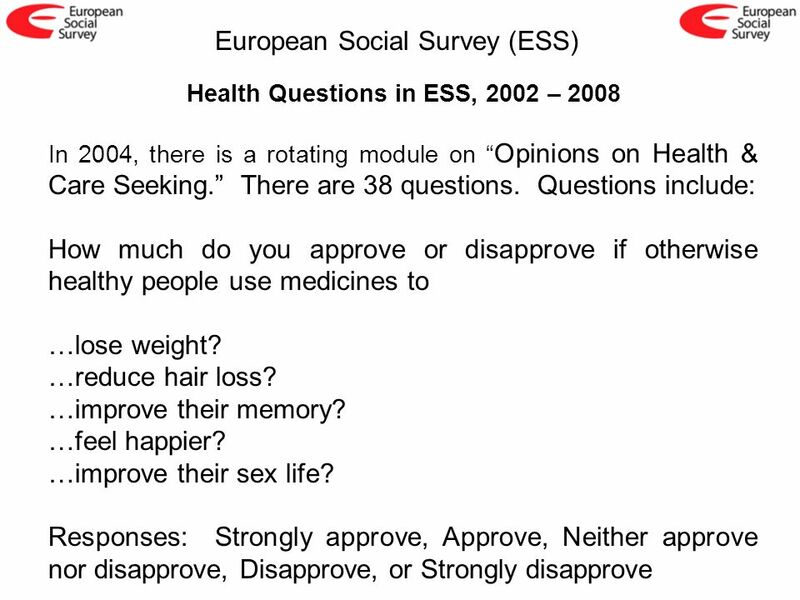 23 European Social Survey (ESS) Health Questions in ESS, 2002 – 2008 In 2008, there is a rotating module on Welfare attitudes in a changing Europe. There are a few questions about health care systems, a total of 8 questions. 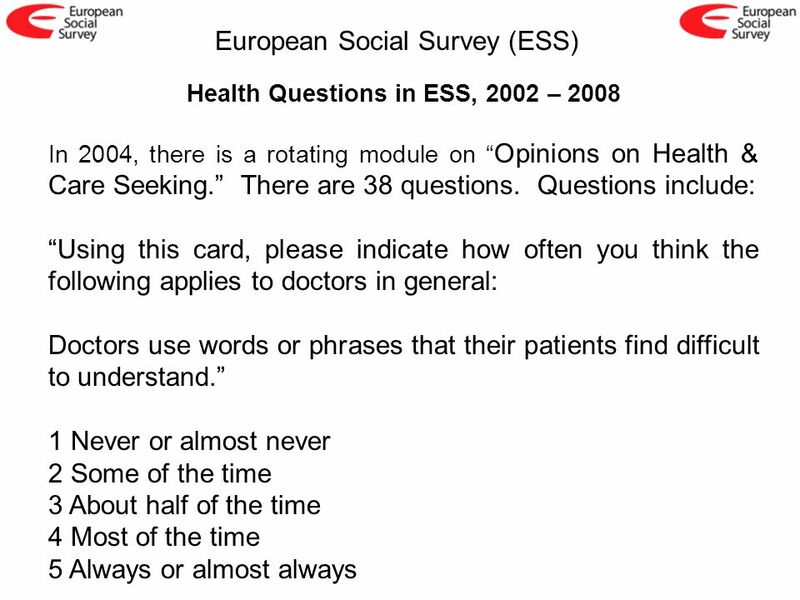 Questions include: Using this card, please tell me whether you think doctors and nurses in [country] give special advantages to certain people or deal with everyone equally? 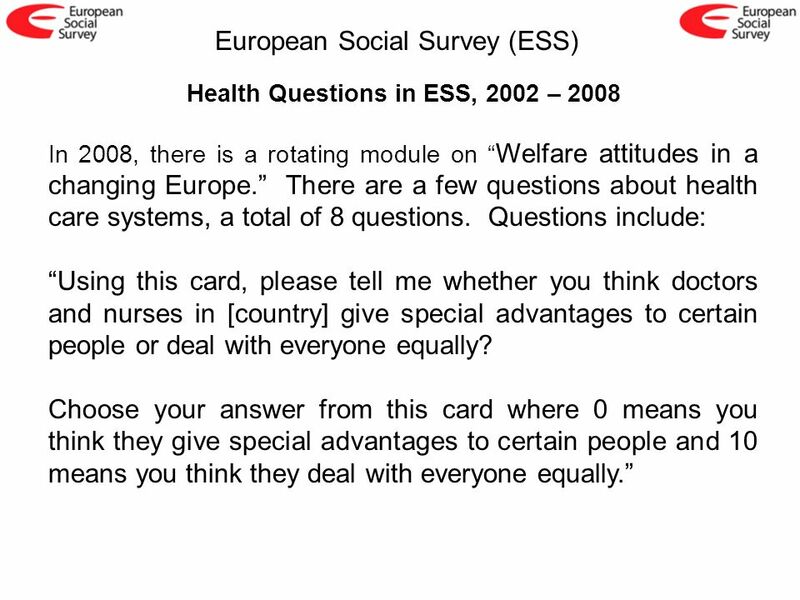 Choose your answer from this card where 0 means you think they give special advantages to certain people and 10 means you think they deal with everyone equally. 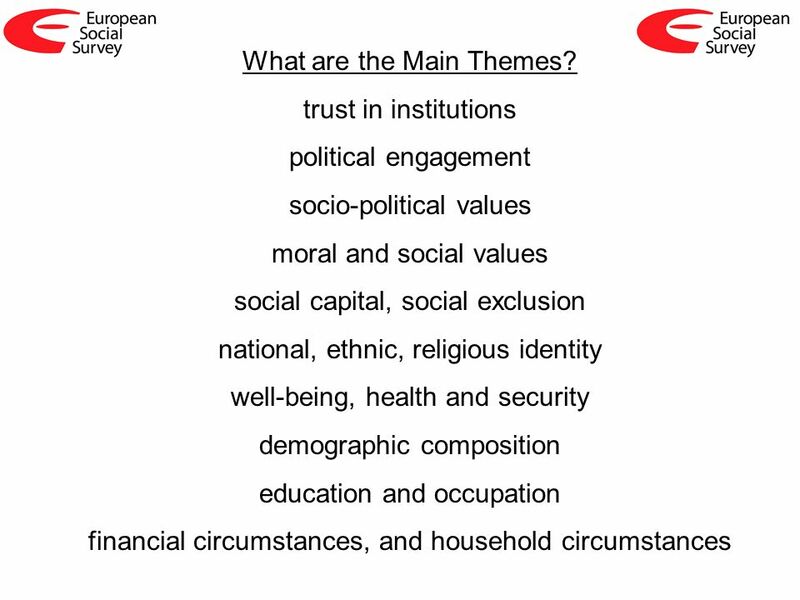 Download ppt "Introduction to the European Social Survey (ESS)." TRANSMONEE an information system to support evidence- based child rights policies and programmes 6 Th European Forum on the Rights of the Child November. The Financial Crisis and Food Security June 2011. Outcomes of a European Survey Kerstin Wittig, Chair of Formal Education Working Group, DARE Forum Warsaw, 14 December 2011. FP6 CivicActive Civic participation and people with disabilities EU Parliament, Brussels 5 March 2008 Gabor Toka Central European University Budapest Patricia.